I want to take a minute to let you and the rest of the Time Clock MTS team know that your product is fantastic. For a small public library with too little money and not quite enough staff, your product is a perfect match of quality and price. Use our time clock system with SQL Server or MySQL and your employees can punch in and out from any Windows computer on your computer network! 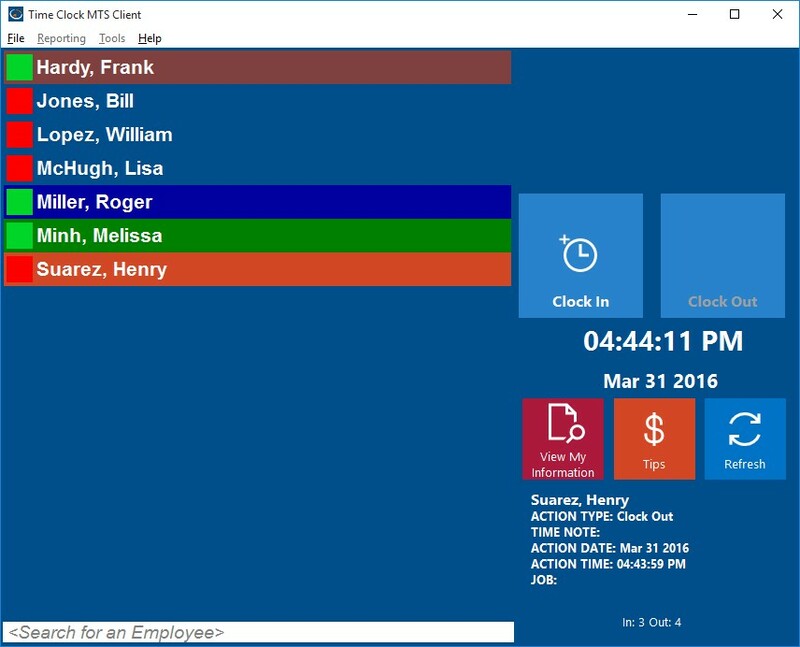 Use the Time Clock MTS Network PLUS Edition with SQL Server or MySQL and you can have your employees punching in and out of any computer with a network connection. You’ll be able to manage your time clock system from multiple computers and you’ll still get access to all of the powerful features found in the Stand Alone Edition and Network Editions of Time Clock MTS. All of the other powerful and useful time clock features are available too. If your employees receive tips or gratuities then we have an employee tip tracking system. 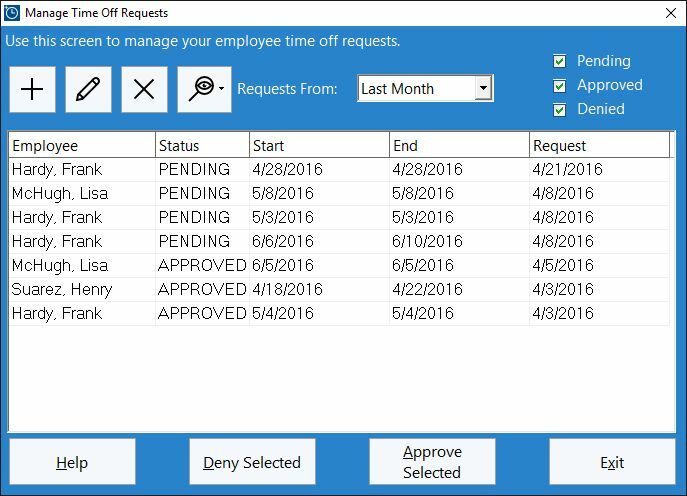 And you can streamline your time off request system using our fully featured employee time off request system that is built right into the software. Of course the powerful and flexible reports that each edition of Time Clock MTS includes. These reports use the attendance data collected from each of your separate time clock computers and give you accurate, timely information with just a couple of clicks of your mouse. Timeclock MTS software has saved us hours of manual calculations and allows us to control our payroll more closely. It’s simplicity belies its ability to track and monitor labor in different areas. It becomes as simple or as secure and full-featured as you need it to be. Managers and supervisors can view the employee timeclock and see at a glance who has arrived at work, and with a mouse click they can see when they arrived and what job they are working on. Employees can leave notes when they punch in and out and your time clock administrator can leave messages for employees which they will be shown when they punch in or out. Reports can be run so you can more easily monitor tardies and alerts can be set up to notify key managers and supervisors via email when certain events occur. Want to know when a certain employee arrives at work? Or when someone places a time off request? Or do you want to know when an employee’s weekly hours exceed your weekly overtime limit? Time Clock MTS Email Alerts can handle all of that and more. And you’ll know critical information about your employee attendance regardless of where you (or they) are in the world. We’ve been using Timesheets MTS Software for our employees for over a year. It makes calculating hours easy, and exports in various formats. Great & affordable to anyone looking for a small business employee management, just thought we’d give them a shout out! 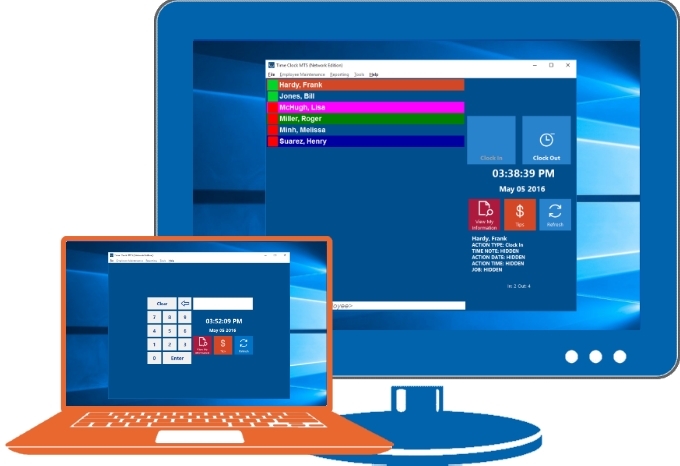 Allowing your employees to record their hours at any Windows computer offers amazing flexibility. Being able to collect all that data and report on it using our reporting system will instantly improve the way you do business. Of course it’s vital then that you be able to use your data in other software systems. Time Clock MTS can export your employee hours to a number of different payroll software packages. 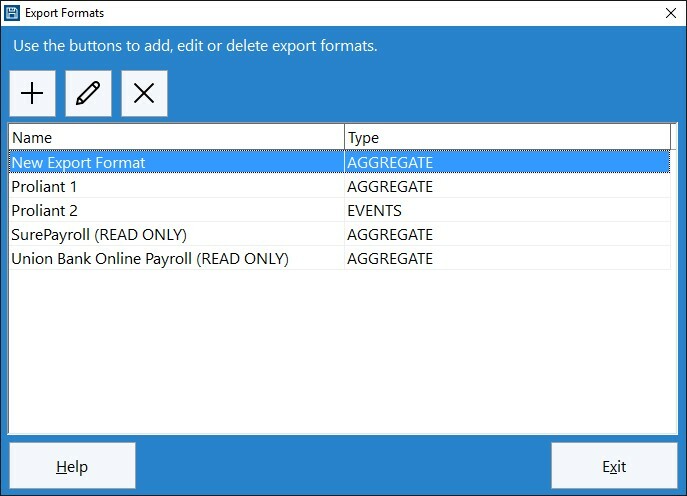 If your payroll system isn’t in our list then a tool is included to build custom export file formats to suit almost any payroll software. In addition all of our reports can be exported to Microsoft Excel, exported to formats suitable for other spreadsheet programs, and printed to secure PDF files. Try it for 30 days without restriction. Install on 20 computers, punch in and out as many times as you like and get access to all the features that are going to save you time and money.